19 April 2017. A research team in Cincinnati discovered a small-molecule drug compound that in lab mice prevents cells in the lungs from becoming inflamed, as occurs in asthma attacks. Researchers from Cincinnati Children’s Hospital Medical Center describe their discovery in yesterday’s issue of the journal Science Signaling. 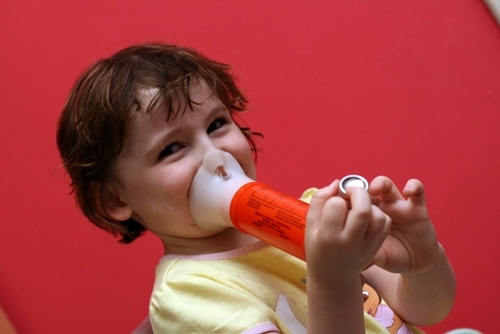 The Cincinnati Children’s team led by pediatrics professor Vladimir Kalinichenko is seeking better tools for physicians treating children with asthma and allergies affecting the lungs. Asthma is a chronic condition where the airways become inflamed and narrow, causing people to experience wheezing, shortness of breath, tightness in the chest, and coughing for periods of time. Centers for Disease Control and Prevention estimates that in 2010 some 7 million children and 18.7 million adults had asthma. Allergies to dust mites and other allergens can cause similar reactions. Kalinichenko’s lab studies protein signals emitted by cells when they malfunction, which result in diseases of the lungs in children and adults. In this study, the team looked into cell signaling processes causing inflammation and excess mucus production in goblet cells, found on the lining of lung tissue. Goblet cells produce the mucus layer that lubricates and protects the lungs, but in people with some allergies and asthma, these cells become inflamed and secrete excess mucus. Similar reactions occur in people with cystic fibrosis and chronic obstructive pulmonary disease, or COPD. The researchers explored protein signals that result in goblet cell inflammation, and identified a protein called Forkhead box M1, or FOXM1 responsible for the proliferation of cells that occurs when they become inflamed. With goblet cells, FOXM1 works through other proteins to cause inflammation, and the researchers used this protein as its target. FOXM1, however, is a transcription factor that controls the transformation of genetic codes in DNA to RNA with instructions to cells, a small protein considered difficult to reach in treating disease. The team called on colleagues at University of Cincinnati Genome Research Center to conduct a high-throughput image screen of its compound library to find potential small-molecule, or low molecular weight, treatments that block or limit FOXM1, particularly in triggering other proteins causing inflammation in goblet cells. Those screens identified a compound code-named RMC-1 that activates proteasomes, protein complexes that break down other proteins into amino acids or peptides. In this case, RMC-1 degrades FOXM1, thus limiting its effects. In lab tests, the researchers provided RMC-1 to mice induced with asthma, sensitized with dust mite allergens, or given the protein interleukin-13 that provokes inflammation and mucus production in airways. Images of tissue samples show in mice given RMC-1, FOXM1 was prevented from entering cells lining the lungs and airways, and prevented interleukin-13 from inflaming goblet cells. Mice with RMC-1 also had less sensitivity to dust mite allergens, reduced inflammation, and greater lung function. The authors say more work is needed to test RMC-1 in higher-order animals, as well as with more types of respiratory diseases, to determine key issues such as dosage and potential toxicity. The researchers also want to reformulate RMC-1 for more efficient delivery, such as with nanoparticles. Cincinnati Children’s technology transfer office applied for a patent on RMC-1.